OK, it’s been a while now since I got married to my Microsoft Surface Pro 3 (read that blog entry here) and there are a few new things to report upon. She is still pretty cute and I do get a lot of curiosity and compliments when we are out on the town. Having cut the cord by sending my good old Lenovo laptop back to IT for repurposing, I am now flying without a net. This has forced me to just dig in and work out these relationship issues. I got a nice big second monitor – and cool little mini display port converter box from Cable Matters which I ordered from Amazon. It has three outputs, a VGA, HDMI and DVI so it allowed me to use my old VGA monitor, but also allows me to project via HDMI onto televisions, high end projectors, etc. My colleague just bought a straight HDMI converter cable, which is a bit sleeker and easier to carry, but I wanted those different options. On a side note, I wish that they made the little cable to the mini display port a bit longer, because when I have the surface standing up it lifts the box off the table (not a real problem, just a tiny bit annoying). So with this setup I can now enjoy a nice high resolution output at a size that my eyes can actually read. I also found where Microsoft moved that setting to. (LOL). If you go into your screen resolution settings. 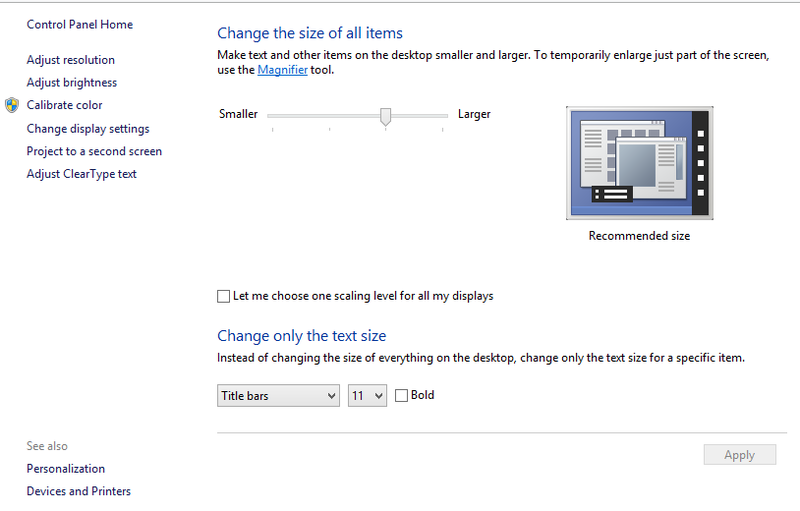 (I prefer just right clicking on the desktop, selecting screen resolution and then the “make text bigger” option at the bottom of the resolution screen), but you can also get there through the control panel “adjust screen resolution” or thru the Windows 8.1 setting icon on the right side (with a swipe in from off the screen), then selecting personalization and then display. Once you are there they replaced the old small >medium> large radio buttons with a new slider that does the same thing. You also have options to make it the same on both monitors, and can select different elements to set the font size individually. One annoying thing is that to get into the ADVANCED Options you have to check the box for applying to both monitors, then suddenly it reverts to radio buttons like Windows 7 had (get the pattern here?) and also allows you to set the scale on a ruler which is actually pretty good if you ever find where it is buried. The best, most wonderful new part of our relationship has arrived! Our new baby Docking Station got delivered by UPS… this cute little bundle even came with an extra power supply! This thing is AWESOME. Now I have plenty of ports, a real keyboard, my second monitor permanently attached (and yes the little converter box lays flat on my desk now), my USB Jabra speakerphone (which I love BTW) and even my speakers when I really want to hear my music (the built-in speakers are ok, but not great). Spend the money if you really want to use this at a desk. it’s the best dock I have used and with the Surface, it makes a huge difference. GET A Docking Station if you plan to use this on your desk at all. Get a good second monitor and the mini display port adaptor that is right for you. Learn how to adjust the size of text, etc if the new super high resolution screen is just too small for you to read well.